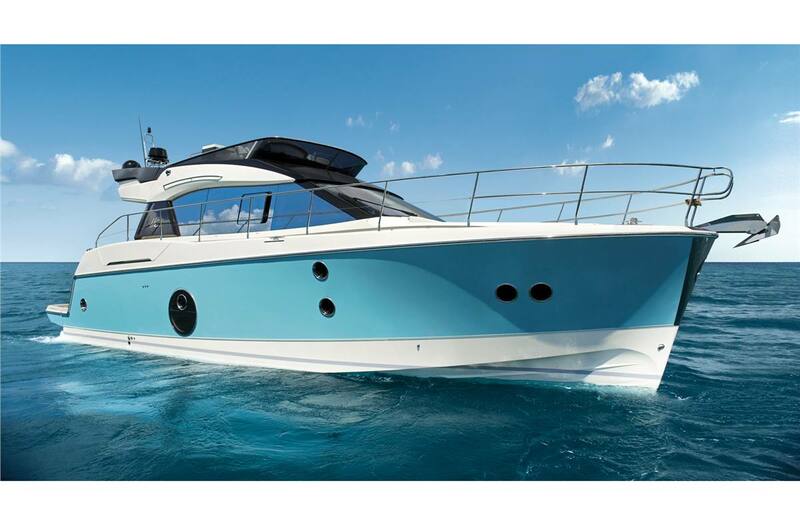 The Monte Carlo 5 conveys the premium spirit of the line with great distinction. This iconic model stands apart for the elegance of its textures, the attention to detail and its highly accomplished Italian design. 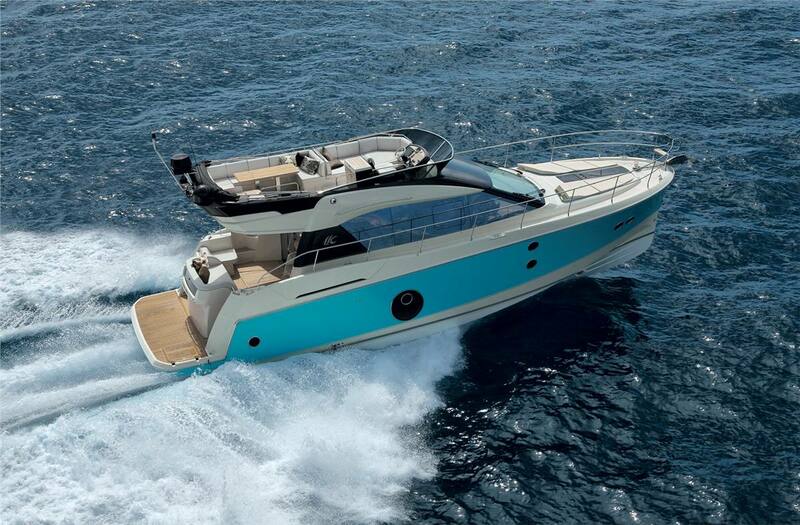 Combining its ancestral know-how and its technological lead, Beneteau has designed a motor cruiser whose values stem directly from those of Monte Carlo Yachts. 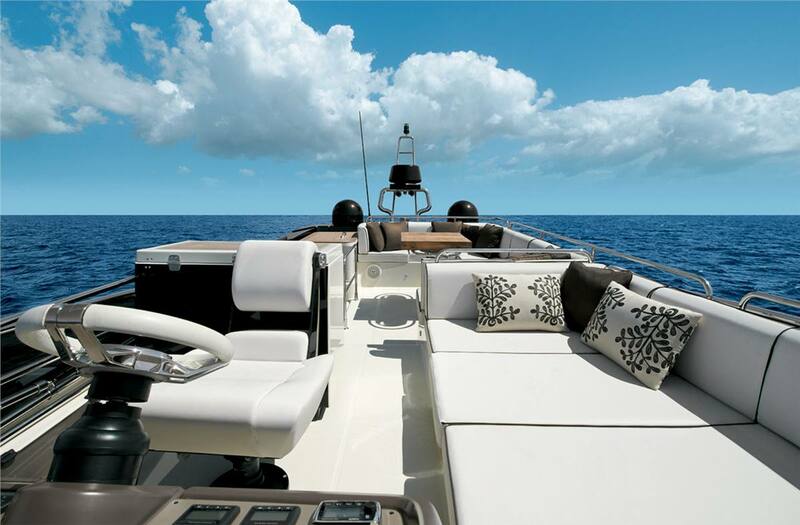 Exterior design: Inspired by the Mediterranean lifestyle, the Monte Carlo 5 has a unique classic appeal. 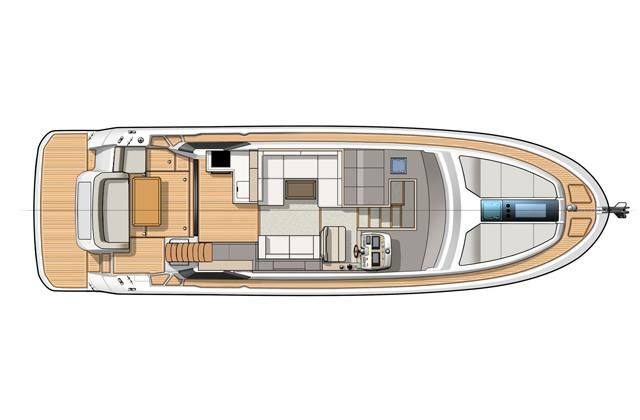 Designed as a genuine living space, the vast shaded Flybridge combines the driving station, sunbathing area, exterior galley and a large saloon for cruises with the essence of perfection. 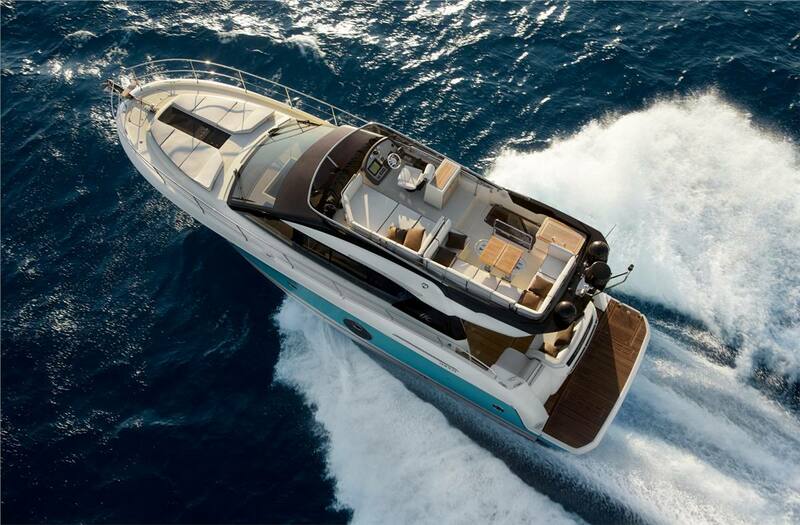 The elegance of its hull together with is Volvo IPS 600 engine promises smooth, high-performance cruising in complete safety. Interior design: The fully retracting glass door seamlessly connects the indoor and outdoor spaces, so that the main deck is an unbroken living space. 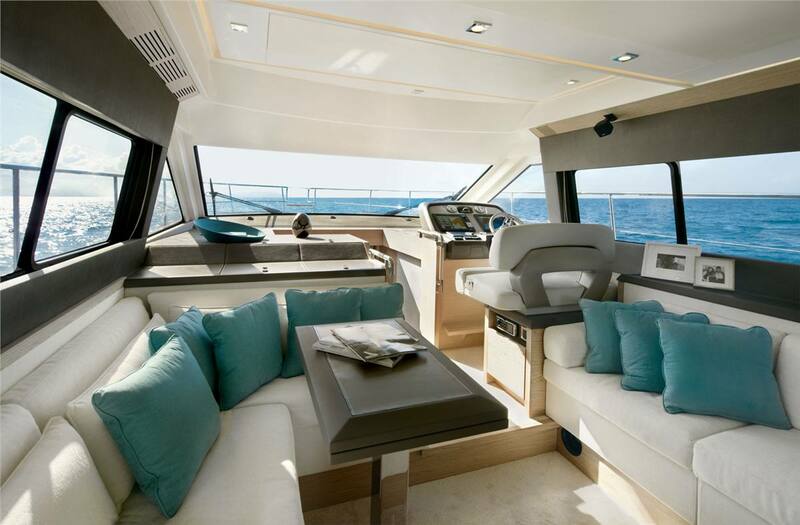 With opposite-facing seats, the lounge brings friendly interaction and a pleasant atmosphere of luxury right into the wheelhouse. 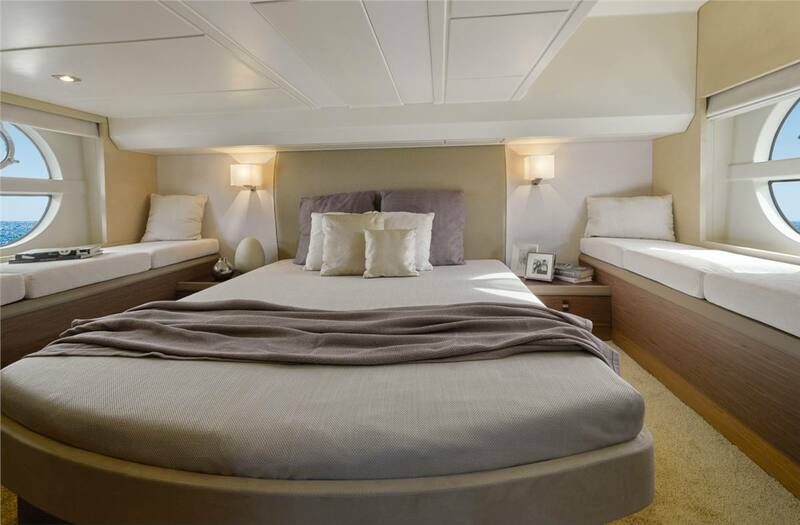 The private quarters’ three cabins and two heads offer quality accommodation with a focus on detail to each of the six occupants. A choice between an open and contemporary brushed light oak or dark but warmer matt Walnut atmosphere offers many ways to personalize the interior. Powerful and timeless: First of the range, the Monte Carlo 5 is its flagship, embodying the timeless elegance typical of quality Italian design in every detail. Both classic and pioneering, she promises high-performance cruising and elegant stopovers. 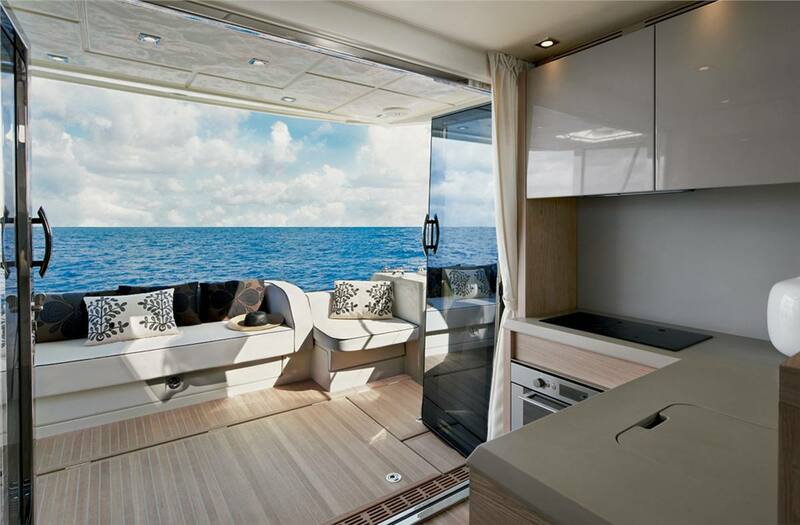 Flybridge: The stunning Monte Carlo 5 Flybridge is fitted out as a living space in its own right. 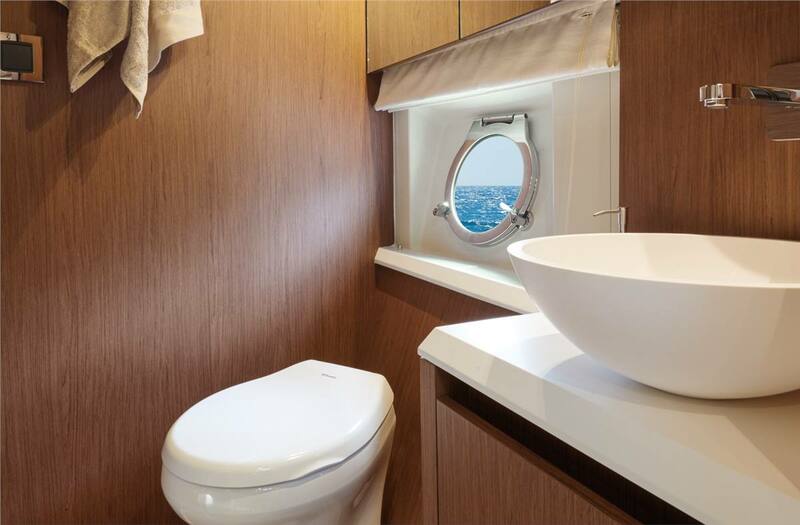 It features the option of an outdoor galley, in which a griddle can be fitted. 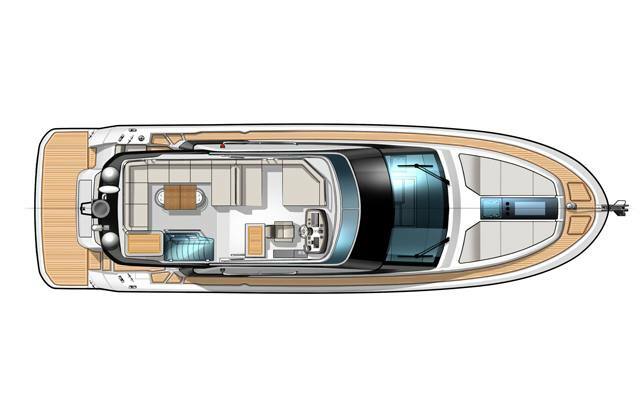 Materials: Bow-plate, careful choice of materials, light inflow, harmony of colors and textures make the Monte Carlo 5 an outstanding boat. 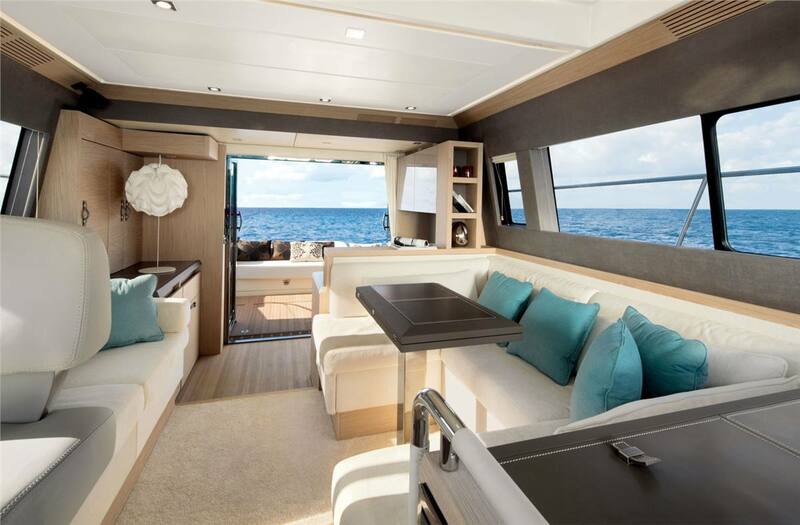 The soft touch finish on corners, hand sewn leather coverings, and carefully polished vegetable-tanned leather furnishings reveal the full expertise and know-how of the Beneteau workshops. 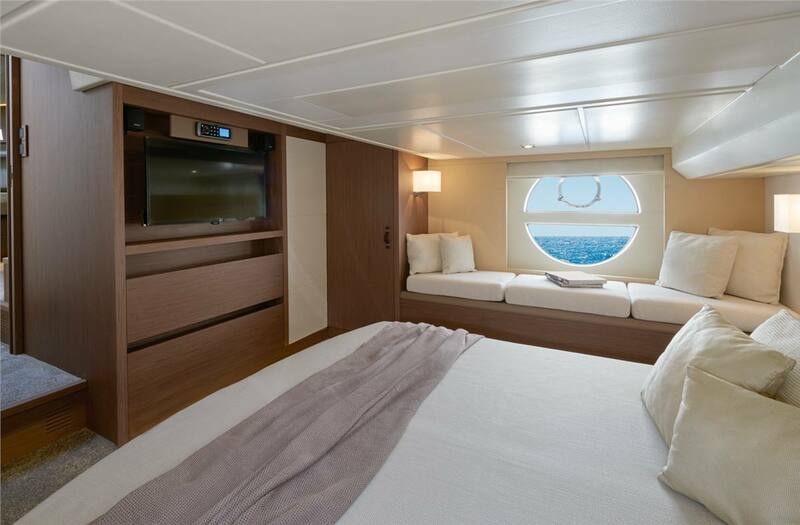 Night spaces: Below deck, the master cabin and the VIP cabin are designed as two luxurious suites with en-suite heads featuring separate showers. 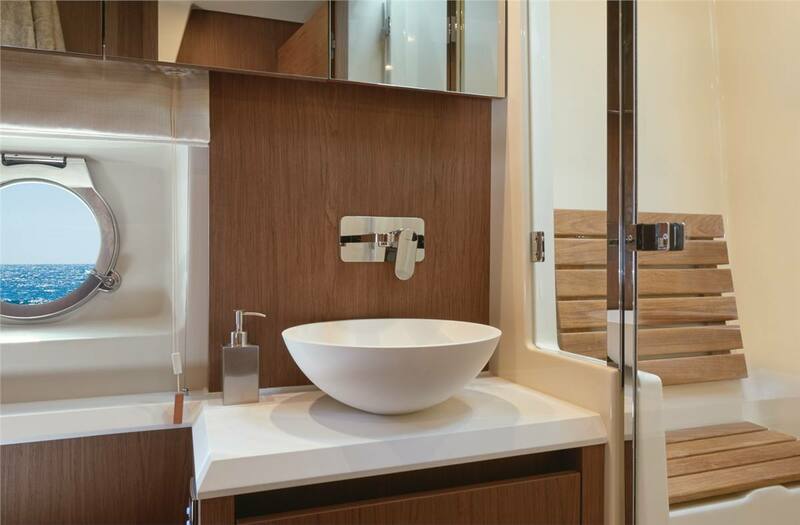 Pamper yourself in the bright comfy atmosphere flooding these incredibly voluminous spaces. Steering station: The steering station has two highly-modern 16” control panel monitors and offers outstanding visibility thanks to the single-piece structure of its windshield. Its tanned leather seat exclusively designed for the range is matchless in terms of comfort. Length Over All: 49 ft. 6 in. Hull Length: 43 ft. 6 in. Hull Beam: 14 ft. 2 in. Fuel tank capacity: 2 x 172 US gal. Fresh water capacity: 2 x 79 US gal. 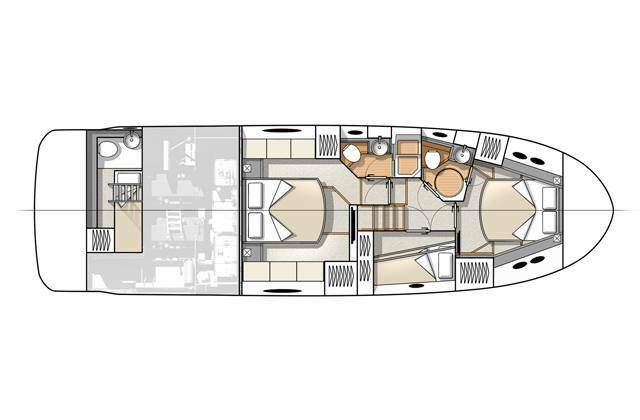 Fully fitted flybridge galley. Additional aft galley with barbecue and sink, on the swim platform level. Large saloon seating 8 people. Fold-away teak table with drinks holder and hand rails. Steering station with adjustable seat and wheel. Control panel fitted with all navigation instruments. Co-pilot's seat converts into a large sun-lounger. 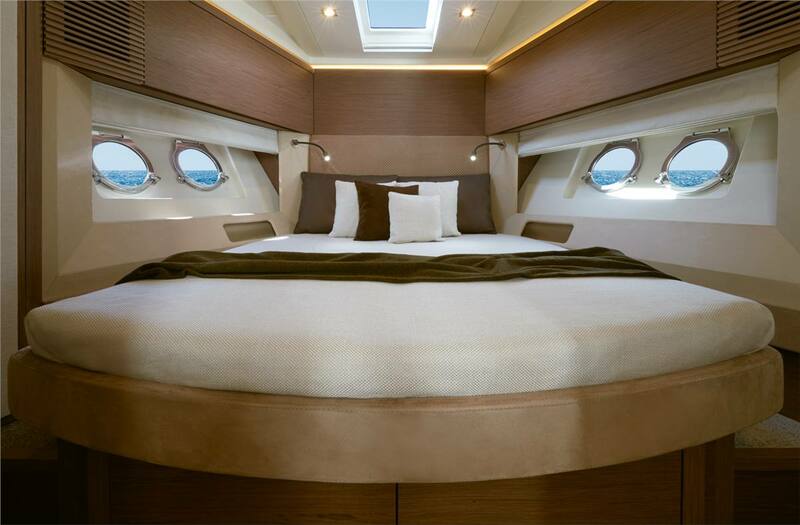 Large relaxation space to the bow. Hydraulic swim platform with integrated tender brackets, built-in ladder with high hand rails. L-shaped perfectly fitted galley opening onto cockpit. Air-conditioning or water operated central heating available. 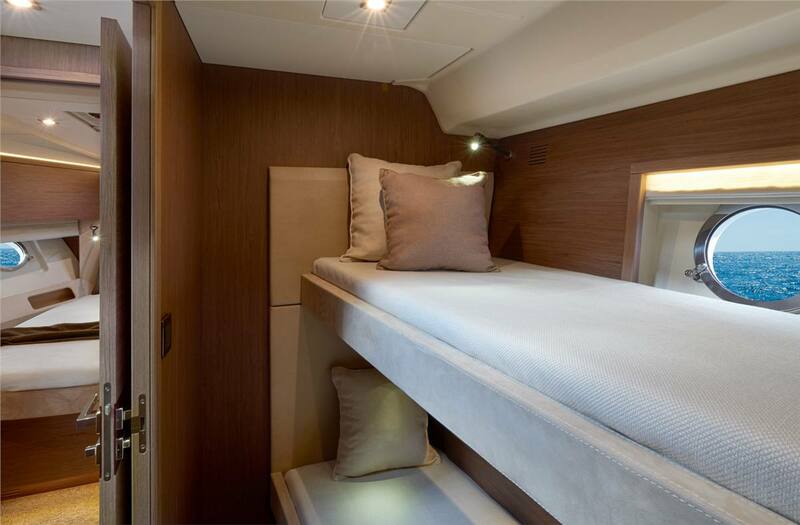 Plenty of storage and hanging lockers in each cabin. 2 x 172 US gal.